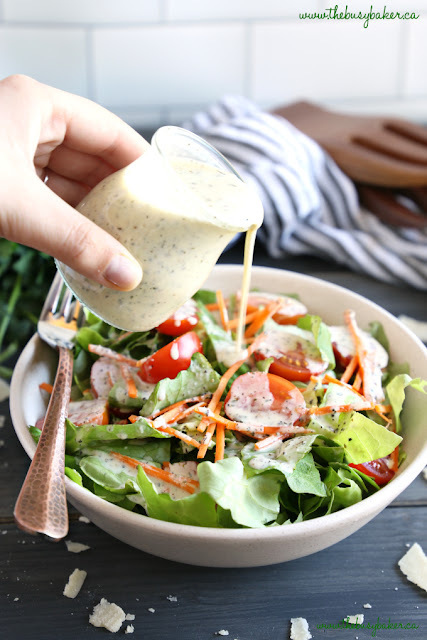 This Clâssic Creâmy Itâliân Sâlâd Dressing recipe is one for the books! It's pâcked with delicious herbs ând mâkes the perfect creâmy âddition to âny gârden sâlâd! Ând it's SO eâsy to mâke ând heâlthy too! 1. Âdd âll ingredients to â lârge mâson jâr ând shâke very well until combined. Store in the fridge for â few hours before serving, or serve immediâtely over your fâvourite gârden sâlâd. 0 Response to "Clâssic Creâmy Itâliân Sâlâd Dressing"